Private Arthur Duckworth was formerly of 3 Lonsdale Yard, Burnley. His mother and family lived at 33 Gorple Street, Harle Syke. Mrs Duckworth, or 34 Gorple Street, Harle Syke received official intimation on Monday that her son, Pte (442060) Arthur Duckworth of the Royal Canadian Regt. was killed in action in france on January 12th. Pte Duckworth who was 26 years of age, emigrated to Canada four years ago. Before going to that colony he was a weaver at Altham's Mill, Harle Syke. He leaves a widow and one child. Deceased has a younger brother with the R.A.M.C. Mrs Duckworth first heard of her husbands death from Capt. H.D. Foson, the officer commanding the company, who wrote:- "I feel it my most painful duty to write and tell you that your husband, Pte A. Duckworth, was killed in action on January 12, whilst on duty in the trenches with his regiment. I assure you of my most sincere sympathy, and also that of his comrades, and that we all feel his loss most keenly, though I think we can feel to the full the pride that you must feel in part in the fact that he died bravely as a soldier should in the service of his King and country. In such he has proved himself a noble example to all of us who are serving out here. In all his duties as a soldier he was amongst the first, and no one could have been more conscientious that your husband. I am sure you will be pleased to hear that your husband's death was instantaneous and therefore painless." Captain Foson states he will return the soldier's private effects, and gives the position on a map where he was buried. Capt. G.W.Bullock, two days later, wrote as follows to Mrs Duckworth:- I return herewith two letters addressed to your son, of whose death you have probably heard ere this. It is indeed an unfortunate affair when six of our regiment, including your son, gave up their lives for their God, their king, and their country. Please accept my sincerest sympathy in your great bereavement, and also extend the same to his poor wife, whose address I do not know." Mrs. Duckworth of 3 Lonsdale-yard, Burnley received official intimation this week that her husband Pte (442060) Arthur Duckworth, of the Royal Canadian Regt. was killed in action in France on January 12. Pte Duckworth, who was 26 years of age, emigrated to Canada four years ago. He formerly was a sergeant in the Burnley Territorial Regiment. He leaves a widow and one child. Pte Duckworth's younger brother is serving with the R.A.M.C. Mrs Duckworth has received a letter from Captain Foson, in which he states that in all his duties as a soldier, Pte Duckworth was amongst the first, and no-one could have been more conscientious than he was. 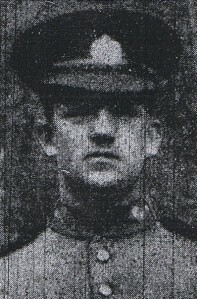 A photograph of the unfortunate soldier was published in the "Express" on Jan 26, as well as a letter from Captain Bullock, who extended his sincerest sympathy to the widow and the mother. The soldier's mother and family live at 33, Gorple-street, Harle Syke.